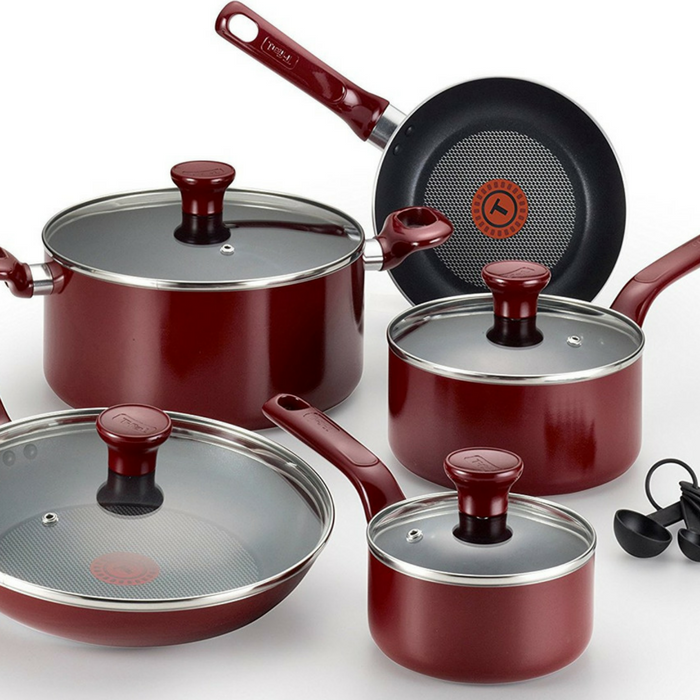 T-Fal 14-Piece Nonstick Cookware Just $45.99! Down From $80! PLUS FREE Shipping! You are here: Home / Great Deals / Amazon Deals / T-Fal 14-Piece Nonstick Cookware Just $45.99! Down From $80! PLUS FREE Shipping! This is great for the coming holiday season or can be a gift item as well! Amazon is currently offering T-Fal 14-Piece Nonstick Cookware for just $45.99 down from $79.99 PLUS FREE shipping! The unique T-Fal thermo-spot heat indicator (fry pans only) shows when T-Fal pans are perfectly preheated to seal in the flavor of your food. The even heat base allows for even heat distribution for reliable cooking results. The T-Fal excite cookware has a non-stick interior that is scratch resistant making cooking and cleaning easy. Ergonomically designed handles are color-matched and oven-safe up to 350 degrees, allowing for an easy transition from stove-top to oven.